My memories of Nelson Royal are golden. If you’ve been a fan of the business for any period of time, chances are you’ve heard stories about him. And if you’re a longtime follower of the mat game, then you can probably tell your own stories about him. Few men loved the wrestling business more than Nelson Royal. That’s what made his passing last weekend a particularly tough pill to swallow. “Nellie,” as he was affectionately known to a generation of fans and friends, died of a heart attack at the age of 66 last Sunday in his hometown of Mooresville, N.C. It had been a normal Sunday morning for Royal, one in which he attended church and had breakfast with a longtime friend, Love Valley, N.C., mayor Andy Barker. But Royal had been complaining about pain in his shoulder the past several months, and on this Sunday morning, the pain had been even more pronounced. According to a report, Royal pulled into his driveway, got out of the car and collapsed in front of Barker’s barn at approximately 12:20 p.m. Emergency personnel were called to try to resuscitate him, but by then it was too late. [ad#MikeMooneyham-336×280]Former NWA world champ Ronnie Garvin had last talked to Royal two days earlier and confirmed that his friend had not been feeling well. Nelson Royal was as well-liked in this North Carolina community as he had been during his 30 years in the wrestling business. A devoted husband and father, a respected businessman and longtime owner of a western specialty store, Nellie had changed little over the years, unlike the business he had devoted most of his life to. Nelson Combs (he later added the name Royal) was born in Wheelwright, Ky., on July 25, 1931. He started wrestling at the age of 17 under the watchful eye of Indian star Don Eagle. With men like six-time NWA world champion Lou Thesz at the helm of the business, a young wrestler couldn’t help but be inspired, Nellie would say. Royal himself would achieve a level of greatness for his realistic, hard-hitting style. He once said there wasn’t a rib in his body that hadn’t been broken, and if it weren’t for anti-inflammatories, he would never be able to sleep. Nellie, however, considered his numerous scars and ring injuries a badge of honor. He longed for the days when wrestling meant wrestling. “Few of them today know a hammerlock from a padlock,” he liked to say. Royal first arrived in the Carolinas in the early 60s as half of a heel tag team along with The Viking (Bob Morse). Sporting a black beard and black vest and billed from London, England, “Sir Nelson Royal” was a perfect complement to his white-bearded, “Scandinavian” teammate. Nellie, who would become one of the Mid-Atlantic area’s top babyfaces in later years, had refined his heel gimmick working in the Pacific Northwest and the Amarillo circuit, where he feuded with the legendary Dory Funk Sr. Bringing The Viking with him to the Carolinas, the two headlined in matches against such teams as The Kentuckians and George and Sandy Scott, but eventually went their separate ways. Morse, whose late-night, hard-living style didn’t mesh with the milder mannered Royal, went to Kansas City where he became a headliner in his own right, while Royal grabbed a cowboy hat, turned babyface and hooked up with Tex McKenzie. Royal, who became one of the top draws for promoter Jim Crockett Sr., was a tag-team specialist in a territory known for its tag-team wrestling, and enjoyed a host of successful partnerships with such stars as Paul Jones, Sandy Scott, Klondike Bill, Les Thatcher, George Becker and Johnny Weaver. His favorite, however, was with the long, tall McKenzie who, as Nellie would say, “was one big, tall sucker – he stood seven foot tall if he stood up straight,” towering over the 5-9 Royal, whose hard-nosed mat style earned him the nickname “Crowbar,” a contrast in technique to the lumbering McKenzie. Royal reflected on Big Tex after McKenzie’s passing last May at the age of 72. Between long runs with McKenzie and Jones as partners, Royal would be involved in memorable programs with such combos as Rip Hawk and Swede Hanson, the Anderson Brothers, Skull Murphy and Brute Bernard, The Masked Infernos (Frankie Cain and Jimmy “Rocky” Smith), Aldo Bogni and Bronco Lubich, The Missouri Mauler and Hiro Matsuda, and The Masked Marvels (Billy Garrett and Jim Starr). 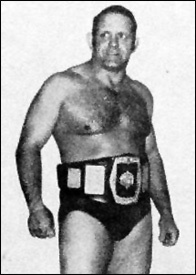 Royal achieved further success during the mid-’70 when he captured the NWA world’s junior heavyweight title in Oklahoma, a title he held five times between 1976 and 1988. A number of his former colleagues from the Mid-Atlantic territory last week paid tribute to Nellie. Royal also trained scores of wrestlers, including a young Ken Shamrock, who moved with his dad to Royal’s ranch during the late 80s while Royal was training wrestlers along with Gene Anderson and running his Atlantic Coast Wrestling promotion. Unfortunately Nellie never made it across that road. But what he left behind is a treasure chest of golden wrestling memories – the kind that will never die.